This Dunedin, Florida hotel located on Florida's West Coast is a boutique waterfront resort with access to the Gulf of Mexico. 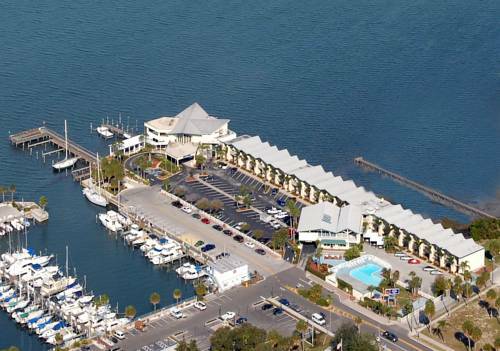 Located at Dunedin's Marina Plaza, the Best Western Plus Yacht Harbor Inn overlooks beautiful St. Joseph's Sound and offers vacationers a friendly port with immediate access to the open Gulf of Mexico. The rooms have either balconies or patios. Each hotel room is comfortably equipped with high-speed Internet access, cable television with HBO , single serve coffee maker, microwave and refrigerator. Have breakfast (additional charges apply) at Tampa Bay's number one waterfront restaurant, Bon Appetit, located on the premises. Guests can enjoy a complimentary USA Today available in the lobby. The Best Western Plus Yacht Harbor Inn offers superb banquet services for special occasions, including sunset waterfront weddings. Charter boats are available at the marina for sightseeing and for world famous Gulf of Mexico deep sea fishing. Nearby attractions include Busch Gardens , beaches, Pinellas Trail, Sponge Docks-Tarpon Springs and the downtown area. Blue Jays spring training baseball fans frequently stay at this Florida Coast hotel for its convenient access to the ballpark. To enjoy the best of the Florida Gulf Coast, reserve a room today at the Best Western Plus Yacht Harbor Inn! Enjoy your stay. From: Interstate 75 or US 19. Go to State Route 580 West, Main Street, to waterfront and marina. Follow to the Best Western Plus Yacht Harbor Inn. Marina Cafe, on premises, bar/lounge, American, open for: lunch, dinner, 11:30 a.m. to 9:00 p.m. Built in a sinkhole in the early 1900s. At one time it had alligator wrestling and a Christian wax museum, and plans were floated to turn it into a nudist camp. Now its mostly gardens and exotic birds.